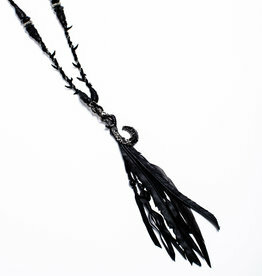 Unisex conceptual leather necklace featuring a refined hook with an obsidian panel, fringes, silver chain and hanging stones. Sterling silver 925% with oxidized finish. 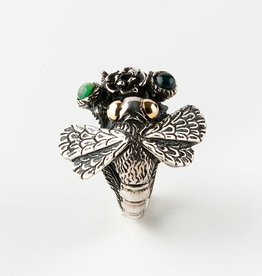 Refined fantastic inspired ring featuring dragonfly contrasting stones. Sterling silver 925% with oxidized finish or you can choose the 18K solid gold detail edition. Refined symbolic ring with flat central studded stone and ascending structure. 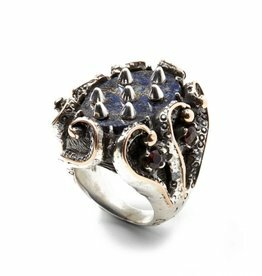 Sterling silver 925% with oxidized finish and18K solid gold detail with onyx and raw Lapis lazuli. Chambri Cluster Necklace ~ A collection of ancient Kualia shells and Silver charms suspended on black leather. A piece to be worn on any occasion. Sawos Cuff Bracelet ~ Individually handcrafted bracelet with a tribal edge, this solid silver bracelet wraps around the arm to create a strong statement. 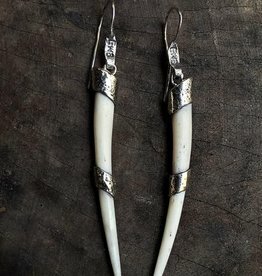 Tika Tusk Earrings ~ Stunning pair of carved reclaimed bone tusk earrings delicately handcrafted with 925 Silver. An elegant statement, these earrings can be worn on any occasion. Abelam Earrings ~ a sophisticated pair of hand beaten 925 Silver earrings with a tribal edge. Variations in texture and form may occur due to being individually handcrafted.